Thanks to an incredible outpouring of community support the Sawtell Cinema is now set to open in December 2015. Thank you!! Over 500 people donated $142,581 to help save our beloved movie house. That's enough money to buy all new seating for two cinemas and two high quality screens with frames and side curtains - so we are guaranteed a comfortable, high quality experience. We can't thank all of you enough for your generosity, love and support. To stay up to date please check out our website and Facebook page. In just 4 short weeks this campaign has raised the initial $75,000 target. That means we have secured all new seats for the Sawtell Cinema. Thank you! Let's not stop there? 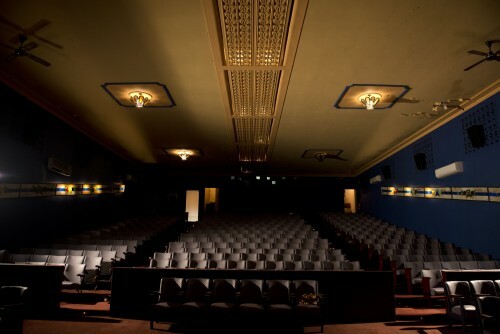 An extra $50,000 raised will fund high quality new screens in both cinemas – including the screens, frames and side curtains. The screen is the heart of the cinema experience – it's what separates cinema from television. Let's make sure our experience is a good one! Please get on board – and engrave your name in Sawtell Cinema history. 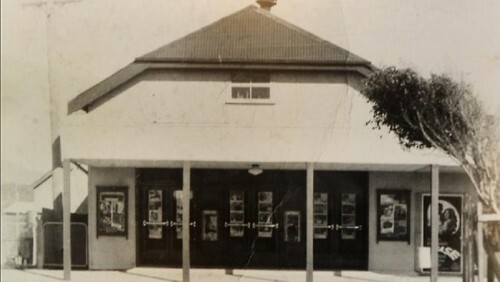 Seventy Four years ago, Doris and Alan Brissett purchased the Community Hall on Sawtell's First Avenue, added some wooden tiered seating and a projection room and the Sawtell Cinema was born. For three generations the Sawtell Cinema remained in the Brissett Family. The cinema has faced many disasters. When the original building was destroyed by a mini-cyclone in 1955, and when floods damaged the cinema in 1989 and again in 2009, the community stepped forward to support their local icon. It was the cost to change over to digital projection technology that eventually forced the closure of this much loved local treasure. The Brissett family put the cinema on the market in March 2012. When no buyer came forward, the cinema was closed in December 2012. For two years Sawtell Cinema has patiently waited for the community to show their support yet again. The Cinema is being designed to retain its quaint, historic feel. A heritage report has been commissioned, the original structure is to be retained and the décor will be in a 1940's style. Our little cinema will retain its heritage, but include all the features you would expect in a 21st century cinema. It's exciting. But it's also expensive and your help is needed to get those cinema doors open again. So obviously, if the cinema is to be renovated, the seats need to be replaced. But it turns out that cinema seats are pretty pricey! This is where you come in. Help us to reach our new target of $125,000 which will fund the purchase of seats and screens in both cinemas. Your generosity won't go unrewarded when you invest in this little piece of Sawtell history. How can I engrave my name in Sawtell Cinema history? Glad you asked! We are offering a number of rewards for supporters. The most enduring is the opportunity to get your name (or the name of someone you love) engraved on one of the new Sawtell Cinema seats. Fancy taking friends and family to munch on their choc tops in your cinema seat? This is a project for the entire community. So, if your budget doesn't stretch to buying a seat, you can join the "I Saved Sawtell Cinema" fraternity for as little as $25. Tell the world how you helped save an iconic, heritage cinema by displaying the "I Saved Sawtell Cinema" bumper sticker on the back of your car (or wherever else you think appropriate). Then enjoy a hand made choc top on your first visit to the newly reopened Sawtell Cinema. Saving cinemas is in fashion – and so is the "I Saved Sawtell Cinema" T-shirt. Wear it with pride, knowing you look great, and you've done a great thing for the community. You will also get a bumper sticker and your first choc top in the new Sawtell Cinema will be on us. Can't you taste it already? David Stratton, former co-host of The Movie Show and At the Movies, is one of Australia's most highly regarded film critics. And he's coming to Sawtell to celebrate the reopening of our cinema. Join David on Saturday 20 February 2016 for a special screening. This is a once only opportunity to join David Stratton at a special movie evening at Sawtell Cinema on Saturday 20 February 2016 and then head out for a private dining experience. The dinner will be held at a private home, away from the public's prying eyes. So this is a unique chance to get to know Australia's most celebrated film critic. You will also be acknowledged on the Honour Board in the Cinema foyer, at the "Cameo" level. Here's a historic opportunity. Engrave your name (or the name of someone you love) on one of the seats in Sawtell Cinema "big" cinema. Next time a great movie opens in Sawtell you could be watching from your very own seat! You will also be acknowledged on the Honour Board in the Cinema foyer, at the "Producer" level. Here's a slightly more exclusive piece of history: your name on one of only 49 seats in the new "boutique" cinema. The name on the seat is up to you. Honour someone you love, remember someone you hope never to forget or even get a bit of exposure for your small business. You will also be acknowledged on the Honour Board in the Cinema foyer, at the "Executive Producer" level. $2500 – Your Silhouette on the "Wall of Fame"
The new cinema décor will include a series of famous silhouettes in the hallway leading to the two Cinemas. Your silhouette will be professionally created and included on the Wall of Fame. Give yourself a wink whenever you go to the movies! Or maybe have a friend, child or lover etched into a community icon. A name plaque will be displayed beside the silhouette. You will also be acknowledged on the Honour Board in the Cinema foyer at the "Director" level. Looking for a way to celebrate a special birthday, wow your customers or just share a special evening with friends? For one evening you can "own" Sawtell's smaller, boutique cinema. Work with programmers to select the film and choose the date, then send out the invitations. We'll throw in a soft drink, beer, wine or champagne and some nibblies for each guest. Oh yes, and choc tops all round! You will also be acknowledged on the Honour Board in the Cinema foyer at the "A-lister" level. If you simply wish to donate and don't want to bother with the rewards, just use the donate button… with our huge thanks! Don't have a credit card or PayPal account but still want to donate? Rewards can be purchased from the Sawtell Post Office, 2/45-49 First Avenue, Sawtell. Alternatively you can email [email protected] for more information. Did you scream “nooooo” when you heard that the Sawtell Cinema had closed? Well, sing “hallelujah!” because Sawtell Cinema is on the way back. See you at the movies in December! Tell the world how you helped save an iconic, heritage cinema by displaying the "I Saved Sawtell Cinema" bumper sticker on the back of your car (or wherever else you think appropriate). Then enjoy a hand made choc top on your first visit to the newly reopened Sawtell Cinema. NOTE: Additional credit card and PayPal fees will be applied. We will refund these fees on request. Saving cinemas is in fashion – and so is the "I Saved Sawtell Cinema" T-shirt. Wear it with pride, knowing you look great, and you've done a great thing for the community. You will also get a bumper sticker and your first choc top in the new Sawtell Cinema will be on us. Can't you taste it already? NOTE: Additional credit card and PayPal fees will be applied. We will refund these fees on request. David Stratton, former co-host of The Movie Show and At the Movies, is one of Australia's most highly regarded film critics. And he's coming to Sawtell to celebrate the reopening of our cinema. Join David on Saturday 20 February 2016 for a special screening. NOTE: Additional credit card and PayPal fees will be applied. We will refund these fees on request. Here's a historic opportunity. Engrave your name (or the name of someone you love) on one of the seats in Sawtell Cinema "big" cinema. Next time a great movie opens in Sawtell you could be watching from your very own seat! You will also be acknowledged on the Honour Board in the Cinema foyer, at the "Producer" level. NOTE: Additional credit card and PayPal fees will be applied. We will refund these fees on request. Here's a slightly more exclusive piece of history: your name on one of only 49 seats in the new "boutique" cinema. The name on the seat is up to you. Honour someone you love, remember someone you hope never to forget or even get a bit of exposure for your small business. You will also be acknowledged on the Honour Board in the Cinema foyer, at the "Executive Producer" level. NOTE: Additional credit card and PayPal fees will be applied. We will refund these fees on request. This is a once only opportunity to join David Stratton at a special movie evening at Sawtell Cinema on Saturday 20 February 2016 and then head out for a private dining experience. The dinner will be held at a private home, away from the public's prying eyes. So this is a unique chance to get to know Australia's most celebrated film critic. You will also be acknowledged on the Honour Board in the Cinema foyer, at the "Cameo" level. NOTE: Additional credit card and PayPal fees will be applied. We will refund these fees on request. The new cinema décor will include a series of famous silhouettes in the hallway leading to the two Cinemas. Your silhouette will be professionally created and included on the Wall of Fame. Give yourself a wink whenever you go to the movies! Or maybe have a friend, child or lover etched into a community icon. A name plaque will be displayed beside the silhouette. You will also be acknowledged on the Honour Board in the Cinema foyer, at the "Director" level. NOTE: Additional credit card and PayPal fees will be applied. We will refund these fees on request. Looking for a way to celebrate a special birthday, wow your customers or just share a special evening with friends? For one evening you can "own" Sawtell's smaller, boutique cinema. Work with programmers to select the film and choose the date, then send out the invitations. We'll throw in a soft drink, beer, wine or champagne and some nibblies for each guest. Oh yes, and choc tops all round! You will also be acknowledged on the Honour Board in the Cinema foyer, at the "A-lister" level. NOTE: Additional credit card and PayPal fees will be applied. We will refund these fees upon request. * $57,776 in offline donations included in total.